Customer Spotlight and 40% off Today Only! Now on with the show! I got an email from a lovely customer this week who made some beautiful centerpieces for her students based on my Blue and Gold Cub Scout centerpieces. 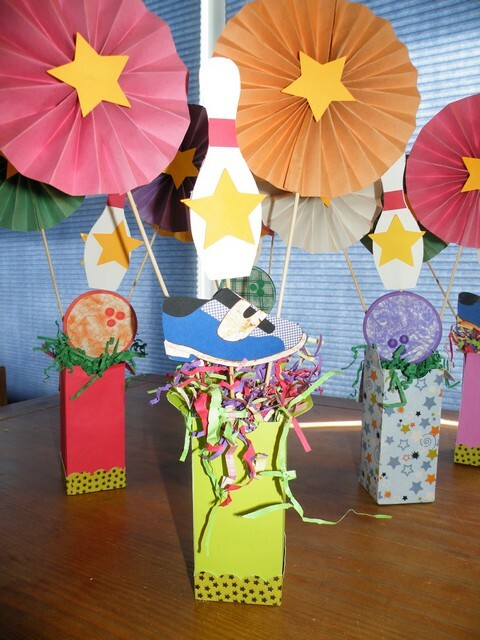 Crafty teacher Elaine Porter used SVG die cuts from the Bowling Fun Clip Art and SVG set on her fabulous creations. “I used a baggie filled with birdseed inside the paper box to weigh it down and then used floral foam and scrap paper on top of that. The kids on the team came over during their Spring Break vacation (that’s dedication!) to help make the paper rosettes. They were very proud of their work! And I used your .svg files that I bought on the MyGrafico site for the shoes and bowling balls.